Infant Massage: The Definitive Guide for Teaching Parents handbook is presented in an accessible, easy-to-read format. The practical advice is based on years of experience teaching parents and professionals and all vital underpinning knowledge is evidence based. This Definitive Guide is the only Infant Massage Teacher handbook to contain relevant anatomy and physiology to support safe teaching. It is a must for those who wish to practise safely and professionally. The Pocket Book to Baby Massage is a charming, pocket-sized, easy-to-follow baby massage guide, which has been specially designed for busy parents who would like to learn how to massage their baby. It includes a no-nonsense, step-by-step massage routine that is accompanied by easy to sing rhymes, to help make massage time fun. The Pocket Guide also contains information about the benefits of baby massage, as well as tips and guidance about when and when not to massage and advice about preparing for massage and what oils are suitable to use. Karen Colder, Qualified Infant Massage Teacher. Teach Yourself Baby Massage and Yoga is designed to introduce parents of young children to the many physical and emotional benefits - for them and their child - of touch in the forms of gentle massage and yoga exercises. It will offer practical and inspirational information, equipping you with the tools you need to enjoy massage and yoga with a young child, from knowing when the best times are, to which oils to use and how to set the environment. It ties massage and yoga in with story-telling, music and rhyme to increase mental and physical development, giving step-by-step guides firstly to simple massage routines for every part of the body. It also offers some simple yoga routines to try safely and effectively with your baby. For parents of children with special needs there is also ample advice and practical steps, in addition to some simple exercises to try if you feel your child is not quite ready for massage and yoga. With plenty of resources and details of courses and workshops, this is a credible and expertly written guide to the healing power of touch for parents and children alike. "As an Infant Massage Instructor I was very keen to read and review this book and I‘m really impressed. It’s a great resource for infant massage teachers, midwives, health visitors and of course parents. Although it perhaps lacks some of the appeal of a ‘coffee table’ book on infant massage – with glossy pages and lots of appealing photos, the actual content is very clearly written, easy to follow and covers in detail the strokes, techniques, holds, philosophy and benefits of baby massage and yoga and the importance of positive touch to both infant and parent. It would perhaps be preferable if the book was ‘ring bound’ rather than a paperback, so that it would be easier to keep open on a page when performing a massage or a hold (as it is from the ‘teach yourself’ series), however the illustrations and descriptions of each technique are very clear and with associated rhymes suggested, would be easy to remember and perform. This is very much a ‘hands on’ reference book that covers a vast amount of information – it could perhaps be a little overwhelming if you were completely new to baby massage or yoga, however for parents who have attended a class or had a short introduction, this would be an extremely useful reference book to dip into." The books in this bite-sized new series contain no complicated techniques or tricky materials, making them ideal for the busy, the time-pressured or the merely curious. Baby Massage is a short, simple and to-the-point guide to learning basic massage techniques for baby in a few short steps. Even if they are completely new to massage, in just 96 pages readers will discover how to master the essential movements and some simple routines to help them bond with their baby. 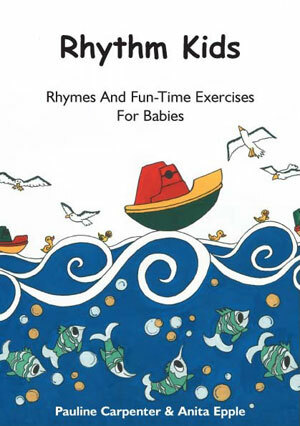 Rhythm Kids® is a beautifully illustrated book and CD containing rhymes and fun-time exercises for babies. The experiences in the first two to three years of life are so important for the emotional, cognitive and social development of an individual, so parents often seek activities that can help them offer an enriching home environment for their child to learn in. This wonderful book may enhance the bond between parent and baby and improve a baby's social, language and physical development. The book and CD also supports the Rhythm Kids® Teacher when running parenting classes. "Great book and CD and even better when you get a chance to undertake a music and movement class with your little one to see the moves demonstrated first hand like we did. Essential item for all conscientious parents who want to help give their little one a good start improve bonding and just get framework to have some serious one-to-one interaction time."